England 1-216 (Alastair Cook 136*, Nick Compton 57, Pragyan Ojha 1-65) trail India 316 (Sachin Tendulkar 76, Gautam Gambhir 60, Monty Panesar 4-90) by 100 runs. The jewel of English cricket, their skipper Alastair Cook, continued haunting India by smashing another ton and became the highest century maker for his country. India was bowled out for 316 runs in the first innings and England gave a sterling reply by thrashing 216 runs after 73 overs for the loss of just one wicket. 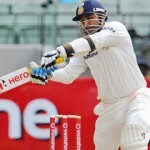 The second day’s play finished on Thursday, December 6, 2012, at Eden Gardens, Kolkata. Earlier, India initiated the day at 7-273 in 90 overs while their skipper MS Dhoni and the tail ender Zaheer Khan were unbeaten for 22 and 0 runs respectively. Zaheer Khan was dropped by Graeme Swann on the fifth ball of the 93rd over in the slip off James Anderson for two runs but was declared leg before wicket off Monty Panesar on six eight balls later. Dhoni tried to accelerate the innings as the wickets kept on falling from the other end and he dispatched two back to back sixes in the 98th over. It took time for Dhoni to reach his 27th Test fifty on the fifth delivery of the 105th over with a four but was gone on the very next ball for 52 off 114 with 2 sixes and 5 fours. India managed 316 runs off 105 overs in their first innings on a good looking batting strip. Monty Panesar once again rocked the rival batting by grabbing four wickets, James Anderson held three whereas Steven Finn and Graeme Swann shared one wicket each. The batsman in-form for England, their captain Alastair Cook along with Nick Compton opened the innings in a cool manner. Cook hit three fours in the first seven overs as Compton secured his wicket by scoring four off 22 balls he faced. Cook got a life on the fifth delivery of the 14th over by Cheteshwar Pujara off Zaheer Khan at 17 runs and that was a costly let drop. The pair scored just 29 runs from 17 overs and the next over was the most productive one, resulting in nine runs with a couple of fours. Alastair Cook started playing his shots and hit the first six of the innings in the 20th over followed by two fours in the next overs. He reached his fifty in the 27th over as Compton carried on creeping from his end and the first hundred of the innings was illuminated on board in the 36th over. The duo enhanced the score to 121 in 42 overs as tea interval was taken when Cook and Compton scored 80 and 41 runs accordingly. Nick Compton reached his maiden Test fifty on the third delivery of the 47th over off 121 balls with 1 six and 5 fours. 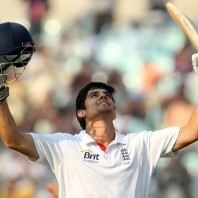 Alastair Cook plundered his 23rd Test ton on the fifth ball of the 52nd over and became the highest century maker for England. He surpassed the record of Wally Hammond that was recorded in 1939 while Geoffrey Boycott, Colin Cowdrey and Kevin Pietersen have also scored 22 Test hundreds. 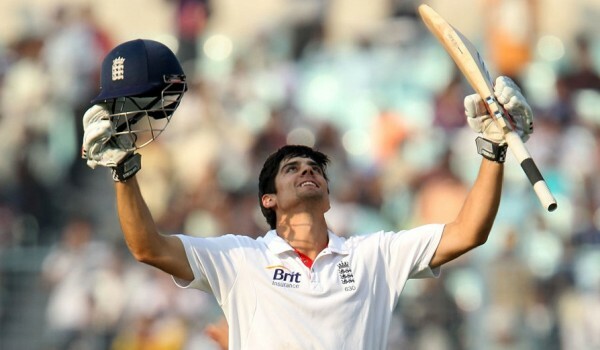 Cook became the youngest ever player to thrash 7000 runs in Test cricket at the age of 27 years and 347 days. The openers laid a solid foundation by amassing 165 runs in 53 overs when Nick Compton was adjudged lbw off Pragyan Ojha for 57 runs. Jonathan Trott got together with Cook next and the latter added 11 runs in the 54th over with 2 fours. Trott opened his account with a four as Cook carried on consolidating from his end without taking any risk. England piled up 216 runs after losing just one batsman in 73 overs, Alastair Cook was hard as rock on 136 off 236 with 1 six and 19 fours whereas Jonathan Trott was gaining his form at 21. England is still 100 runs behind the first innings total of India and the hosts will try to grasp few early wickets to come back in the game. England is going solid and with plenty of batting still to follow, they can get a deciding lead in the opening innings.